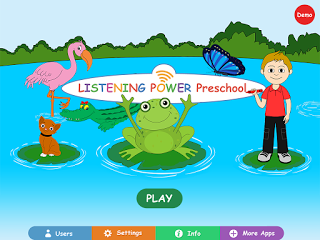 Listening Power (preschool): App review & giveaway!! 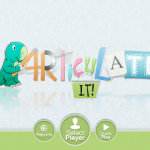 I am so excited to share with you a brand new app by Hamaguchi Apps. They were generous to provide me with a copy to try and share with all of you AS WELL AS not one but TWO codes to give away as well!! 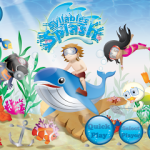 For all of you preschool SLPs out there….check this one out!! (I also recommend this one for low functioning elementary students). If you are familiar with other Hamaguchi Apps, the set up is just the same. 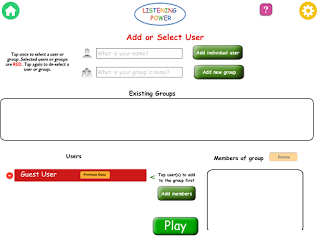 You can click the “user” tab and add users and groups. 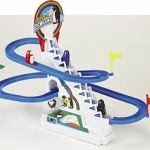 This will help with collecting and tracking data. It can take a moment to get used to their set up, but once you get it it only takes moments. No time to set up, just click play! Just note, that if you play as a “guest” you cannot store the data, so write it down or do a screen shot so it will be saved in your photos! 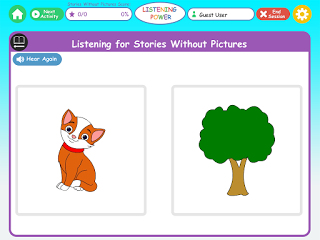 For all of the activities in this app, students are given prompts to listen to a prompt and select an image to respond to the task at hand. There are all different activities you can go through all of them at a time or just work on one at at time using the settings. When students select the correct answers, they are reinforced by hearing it again. If incorrect, nothing will happen which will let them know they can try again. 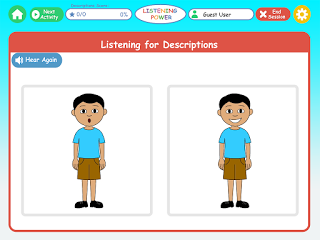 Listening for descriptions: the app warns students “listen” waits a moment and then gives them a description and students must touch the image that is being described. For this image below it said “Who is happy?” I love that the app has a “hear again” button! I am always teaching my kiddos to request repetition if they recognize they were not attending properly or need to hear it again to ensure they can respond accurately. 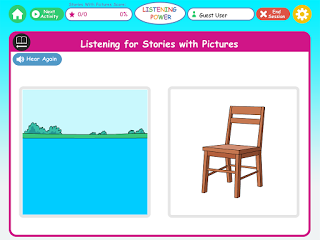 Listening for stories with pictures: Students are prompted to listen to a story and shown an image. 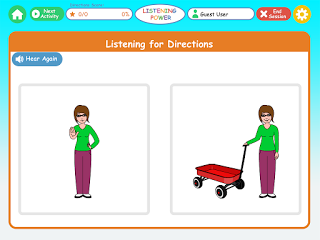 Then it prompts the students “ready?” which gives them a cue that a question is coming! Then they ask a question about the story heard. 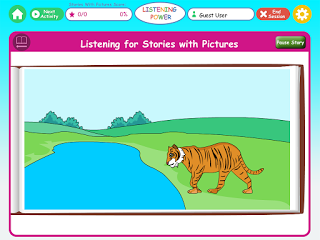 For the example below, “where did the tiger drink the water?” Students are asked a variety of WH questions about the story. 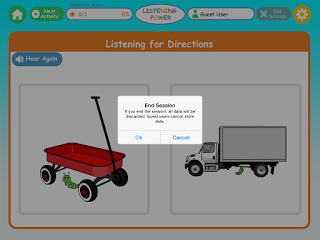 They can always click the “pause story” if you need to redirect, refocus, or review strategies. 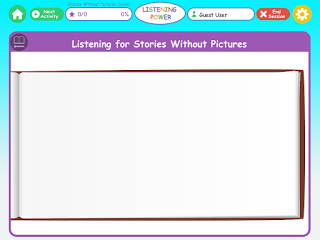 Listening for stories without pictures: just like the activity above, students are expected to listen to a without a visual then asked questions. The questions have picture choices though. 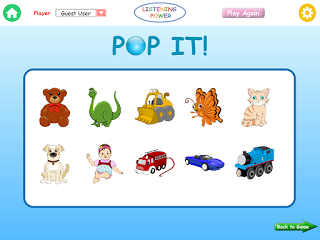 Students are rewarded with a “pop it” game. 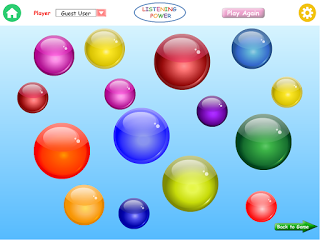 Student can select an image, then can pop the bubbles to find the prize. I love that even the game gives auditory directions!! 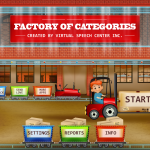 It is just a simple and cute game that you can also use to address so many goals: describing, “where” questions, prepositions, and more! 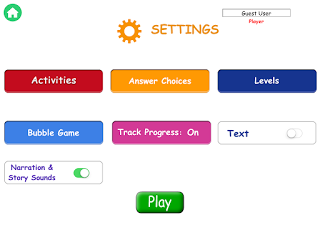 At any time, you can select the “settings” button to reset directions from within the app activity. You can also select “next activity” if you want to skip one, view scores, go back to the “home” screen, or hit the “end session” button. I love that it prompts you to make sure you really want to end! Gotta love the data collection!! You can see all of the activities, what was correct and #s! 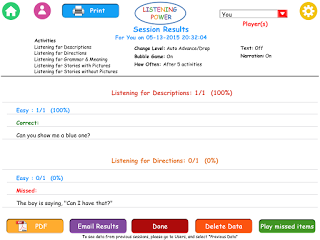 This is great for planning future sessions! 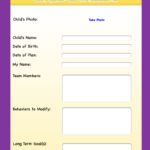 You can make the data into a PDF, email, delete, print, or play missed items! Just change the “player” to see another user! I love that you can see the settings that you had set for that student on their data sheet. I love that this app is multiplayer and that you can do various activities and store data! 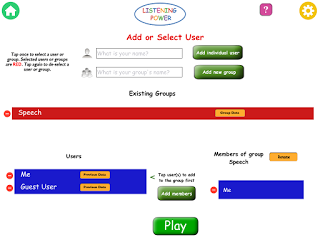 It easily switches from one player to another when you select a group to play at a time. I also love that this app is slow paced and you can control the speed and how you use it. 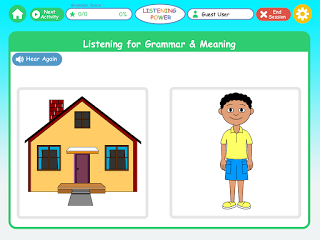 It uses prompting that we use automatically as SLPs such as “listen” “ready” “listen to this story” and restating correct answers. You can view the You Tube video demo HERE! LOVING this app?? Want to win one for yourself?! Enter below! !